These resources are available for those who have already been accepted into Transforming Community and need financial assistance. Please be sure to fill out an Application for Transforming Community and receive confirmation of your acceptance before you begin fundraising. For more information regarding application see our Frequently Asked Questions and look under Application Process. One of the first decisions you will need to make is whether or not to engage social media to make contact with your network of friends. Some of our fundraisers have posted their appeals on Facebook and had good results. Others have chosen not to be so public about their experience, and have written emails and letters to family and friends active in their relational networks. Of course, you can combine these strategies...your particular approach is up to you! 1 Set up your account here. If you do not already have an account with us, go to CREATE A SECURE ACCOUNT, scroll down and complete fields below. SUBMIT to create account. 2 Once you are logged in, go to CAUSES on the left of the screen. 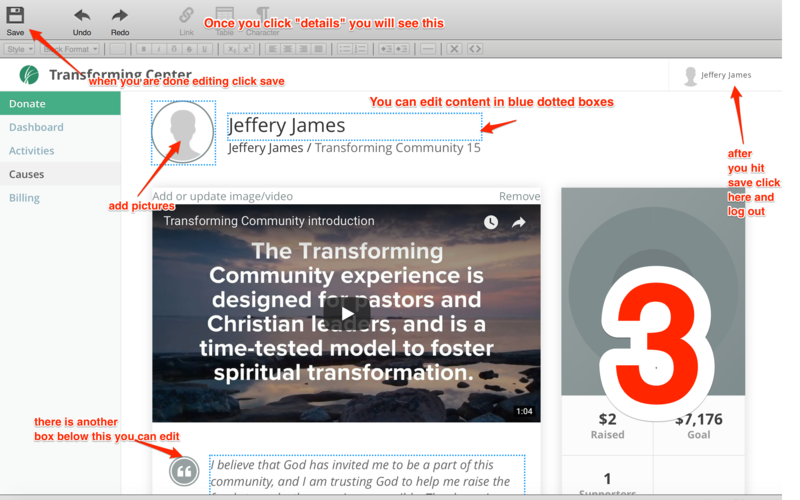 Click DETAILS in the Transforming Community campaign box. Next CREATE A TRANSFORMING TUITION FUND and begin personalizing your site as shown below. Consider your circles of influence and support, those who might be most likely to understand your desire to participate in this type of spiritual formation journey. Gather their contact information and decide whether to send an email, a mailed letter or both. All the of our sample letters can be edited to suit your needs. Use the Sample Letter provided. This letter/email will need tweaking and personalization so be sure to read it through carefully before sending. Send out your appeal letters and emails as soon as possible so you can reach your fundraising goal by February 1. Schedule any meetings or phone calls with those you think might be uniquely interested or capable of supporting you in this experience. Stay connected with perspective donors. The most successful campaigns are completed within 30 days and have several touchpoints including follow up emails and conversations. 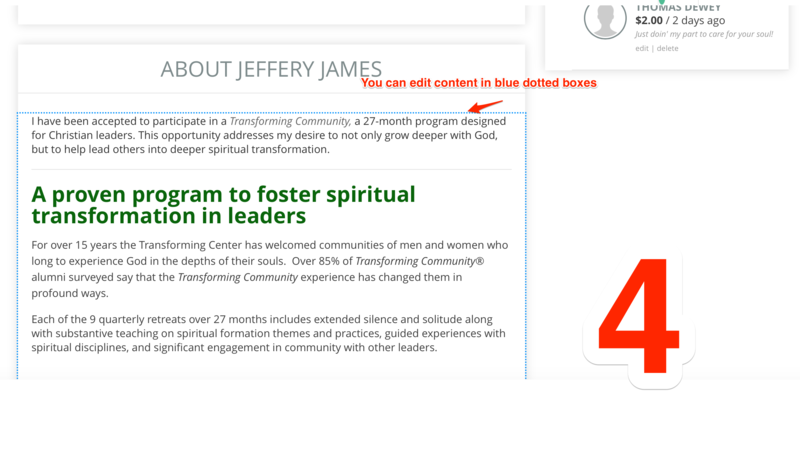 Create at least 1 update per week to share with your network through the micro site. Your contacts may have questions that they bring to you regarding the Transforming Center and the Transforming Community experience. Please feel free to direct them to any part of our website or see the FAQ section below. Here are a couple emails that might be helpful as well. While your supporters will get a thank you and confirmation of their gift through the micro site, it is always meaningful to send your own thank you as well. Donations to your campaign via check should be sent directly to you, followed up with a payment from you to the Transforming Center. If at any point you have questions or concerns please feel free to reach out to us! Below are some answers to frequently asked questions that you may encounter as you invite your family and friends to help with your TC expense. What happens in a Transforming Community? A Transforming Community is a retreat-based spiritual formation experience with nine quarterly retreats. Each retreat includes substantive teaching on spiritual formation themes and practices, guided experiences with spiritual disciplines, and significant engagement in community with influencers from diverse backgrounds and theological traditions. We ask our retreatants to abstain from technology during retreats so they will have opportunities for extended silence and solitude to rest and pay attention to what is happening in their souls. Why does a Transforming Community require 27 months to complete? Leaders are accustomed to attending weekend seminars or conferences that last 1-3 days, and cost several hundred dollars. Sadly, the impact of these one-time events is often short-lived. The Transforming Center believes that true change happens incrementally…over time…in community with others. Retreatants use the three-month intervals between retreats to practice what they have learned in retreats, and integrate those new practices and learnings into their lives. Can you help me understand the cost of a Transforming Community? Because of the comprehensive nature of this program and the fact that it spans two years, there is a significant cost associated with a Transforming Community experience. The fees include everything you need while on retreat: a private room and bath, five hot meals, healthy and plentiful refreshments throughout the retreat, retreat materials, plus a beautiful reception the second night while on retreat. That is in addition to the six teaching sessions, eight worship services, spiritual guidance for your solitude times, and group spiritual direction. Comparable leadership experiences in the corporate sector are far more expensive, while the cost of similar programs hosted by other ministries are in line with or more expensive than the cost of a Transforming Community. Currently the Transforming Center is affiliated with an academic institution so that a degree can be earned in concert with the experience. As well, if retreatants complete certain requirements, they are eligible to receive a Certificate of Spiritual Transformation from the Transforming Center at the conclusion of their community. Based on the track record of previous Transforming Communities, what impact would you expect to see on your life, leadership, and ministry? Our 600+ Transforming Community alumni have not been shy about sharing the impact of their experience upon their lives and ministries. In a recent survey, more than 85 percent of our alumni said their Transforming Community experience had a profound impact! Many have said that the experience literally saved them—spiritually and emotionally—as well as saving their ministries. At the conclusion of each community, we are always in awe at the ways that God has shown up so personally and profoundly for so many. There are countless stories of transformation that have led to rejuvenated leaders in their families, churches and organizations. Will you be updating me re: your Transforming Community experience? We recommend that you consider offering updates. But how, and when you do so will be up to you. Note: Some inquirers may want to know more about what, if anything, has happened in your ministry or leadership experience that would make you want to participate in a Transforming Community. We advise you to use discernment about what you share, and how openly you share some of these things that can be deeply personal. While you may wish to give your prospective donors some sense of what has happened to you in your life in leadership or the deepest longings you have as it relates to your spiritual journey, you are not obligated to give intimate details of your experience to anyone other than those you trust you most. And the same is true when you update your donors during and after your community experience. *Crowdfunding can be a great way to raise money for a variety of experiences and projects however it is important to realize that these contributions are not tax-deductible as they are given to meet strictly a personal expense — your participation in Transforming Community —rather than a donation made to the Transforming Center, a 501(c)(3) non-profit organization. Sometimes it can be difficult to describe what the Transforming Community is and why it's such a significant journey for leaders looking to be in God for the world. Hopefully these links and other language on our website will help!